These names and formats sound complicated, but you can easily convert to and use these formats without having to know anything more than the names. *Only PowerPoint 2013 and newer versions. The 32-bit version of PowerPoint 2010 can play an .mp4 or .mov file only if the computer has a QuickTime Player installed. (Read Download QuickTime for Windows, on the Apple site, for more information.) PowerPoint 2013 and newer versions DO require the QuickTime Player to be installed for playing MP4 video files in one particular situation: when you are using Windows 7 running on a virtual machine (VM). **Adobe Flash isn’t available in Office on a Windows RT PC. Want to see what version of Office you're using? If you experience slow playback, a lag between audio and video, audio stuttering, or frames being lost, see Tips for improving audio and video playback and compatibility. PowerPoint may also support additional file types if you install additional codecs on your PC. If you want to learn about finding codecs for your PC, read Are you having playback issues (in PowerPoint)? 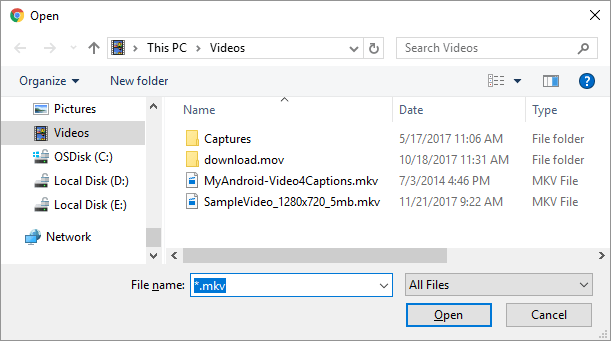 Certain older video file formats may not compress or export properly in Office on a Windows RT PC. Instead, use modern media formats such as H.264 and Advanced Audio Coding (AAC), which PowerPoint 2013 RT supports. PowerPoint 2010 supports the AAC format if the correct codec (such as ffDShow) is installed. Want to see what version of Office you're using? Music files purchased from the iTunes Store can only be played on authorized computers, so people whom you share presentations with might be unable to play iTunes files. Windows Media files (.wmv, .wma) aren't supported on PowerPoint 2016 for Mac or PowerPoint for Office 365 for Mac. However, if Flip4Mac is installed on your Mac and you already have a .wmv or .wma file inserted on a slide, PowerPoint will offer to convert it in place to an .mp4 or .mp3 file. Read the Flip4Mac download page to see if this plugin supports your version of macOS. * Windows media format (.wmv) requires a that you install a plugin named Flip4Mac for playback on macOS. Read the Flip4Mac download page to see if this plugin supports your version of macOS. ^QuickTime Virtual Reality (QTVR) files, which also have a file extension of .mov or .qt, don't play in a PowerPoint for Mac 2011 presentation. Music files purchased from the iTunes Store can only be played on authorized computers, and people with whom you share presentations might be unable to play iTunes files. You can play the following audio and video formats in PowerPoint Mobile and PowerPoint for Windows Phone 10, but you can't play YouTube videos. Click Select Files. The Open dialog box appears. 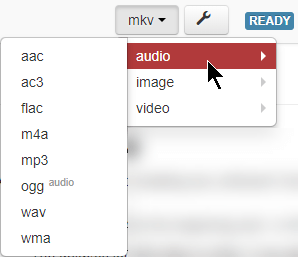 Navigate to the folder that contains the video or audio file you want to convert. Alternatively, to select a file stored in the cloud, select the arrow next to Select Files, and choose the cloud system (Box, Dropbox, Google Drive, or OneDrive) where your media file is stored. Select the media file and then click Open. The name of your selected media file and its format are shown on the page. Click the Format button ( ), and choose the appropriate format for the media file. 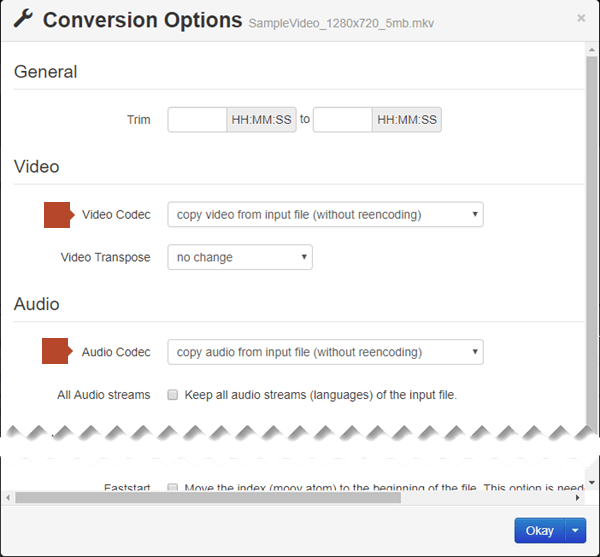 Select a Video Codec, and/or Audio Codec. The web page now summarizes the conversion: The format you're starting with is named on the left side, and the format that it'll be converted to is named on the right. Click the red Start Conversion button at the bottom of the page. When the conversion is complete, a green Download button appears on the page. The file is copied to your Windows Downloads folder. You can then move it to any folder you like. It's ready to be inserted in your PowerPoint presentation. Go back to the PowerPoint slide where you want to insert your video or audio file. On the toolbar ribbon, on the Insert tab of the Media group, choose the arrow under Audio or Video and then choose the appropriate command for inserting your file.